Another theory is that ST really stood for "Sam Tramiel", Jack Tramiel's eldest son. The Atari ST was a notable home computer, based on the Motorola 68000 CPU, with 512KB of RAM or more, and 3.5" floppy disks as storage. It was similar to other contemporary machines which used the Motorola 68000, the Apple Macintosh and the Commodore Amiga. 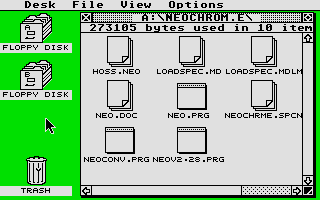 Although the Macintosh was the first widely available computer with a graphical user interface (GUI), it was however limited to a monochromatic display. The Atari ST was notable, being the first computer with a fully bit-mapped color GUI. It had an innovative single-chip graphics subsystem (designed by Shiraz Shivji) which shared the full amount of system memory, in alternating clock cycles, with the processor, similar to the earlier BBC Micro and the Unified Memory systems that have become common today. It was also the first home computer with integral MIDI support. The ST was primarily a competitor to the Commodore Amiga systems. This platform rivalry was often reflected by the owners and was most prominent in the Demo Scene. Where the Amiga had custom hardware which gave it the edge in the games and videowork market, the ST was generally cheaper and slightly faster at basic operation. Thanks to its built-in MIDI ports it enjoyed success as a music sequencer and controller of musical instruments among amateurs and professionals alike, being used in concert by bands such as Tangerine Dream. In some markets, particularly Germany, the machine gained a strong foothold as a small business machine for CAD and Desktop publishing work. The ST was later superseded by the Atari TT and Falcon computers, and ST technology was used in the creation of the Atari Jaguar video game console. Since Atari pulled out of the computer market there has been a market for powerful TOS-based machines (clones). Like most "retro" computers the Atari enjoys support in the emulator scene. Atari had created two released machines in the form of the Atari 2600 console (also known as VCS) and the various Atari 8-bit based home computers. Both of these lines were created around the 6502 CPU and included a number of additional chips assisting this rather basic, but cost-effective CPU in providing graphics and sound. In fact the 8-bit machines had originally intended to be the replacement for the 2600, but they were later reengineered as home computers. As Atari grew and the management was shuffled by Warner (their parent company), the creators of the 2600 and 8-bit machines eventually got fed up and left. A group of them led by Jay Miner formed a small think tank called Amiga in 1982 and set about creating the third generation machine, this time based on the much more powerful 68000 CPU. During this time, the home computer market started to slow down, and the video game market underwent the great video game crash of 1983. Warner management decided to "get out" and started looking to sell Atari outright. Meanwhile many of the same effects were in the process of decimating Commodore International. An argument involving Commodore's chairman and largest shareholder Irving Gould, and Jack Tramiel ensued over development of a new 68000 system, resulting in Tramiel's immediate departure from Commodore in January of 1984. Tramiel immediately formed a holding company, Tramiel Technology, and brought in a number of ex-Commodore staff to continue his project to develop a new, high-performance home computer. While this team, led by Shiraz Shivji, worked on the design, Tramiel discovered that Warner Communications wanted to sell Atari Corp. Tramiel purchased Atari Corp, mainly for the overseas manufacturing and dealer network. The design team considered "one-upping" the Macintosh by using a full 32-bit chip, namely the NS32032, but in talks, National Semiconductor couldn't supply the numbers, or price, the project needed. In retrospect this proved to be lucky, a prototype built on the NS32032 proved to be slower than the 16-bit 68000. The basic hardware design quickly "gelled" into a form that was almost identical to the ST that eventually shipped. The design used off-the-shelf parts where possible. Disk drive support was provided by the WD1772, a standard Western Digital chip, and sound from a Yamaha YM2149, a clone of the common but fairly basic General Instruments AY-3-8910. Serial, MIDI, and other I/O functions were provided by standard Motorola chips. The custom chips included a memory controller, the simple "Shifter" graphics chip, a DMA controller, and the "GLUE" interrupt handler. At about the same time, Amiga were desperate for a buyer or investor, and the "Warner owned" Atari had paid Amiga for development work (see: "TOP SECRET: Confidential Atari-Amiga Agreement"). In return Atari was to get one-year exclusive use of the design. Atari was also working on a "high-end" 68000 based machine at the time, so it is not clear what their intentions for the Amiga design were. By May Tramiel had secured his funding, bought the remains of Atari from Warner for a very low price, and set about re-creating his empire. One of his first acts was to fire practically all of Atari's highly respected engineering staff, and cancel almost all ongoing development. The Amiga crew was upset, and soon entered discussions with Commodore that led to them purchasing Amiga, and quickly cancelling Atari's license. Tramiel was furious, and the resulting court case lasted for years. Finally, it settled out of court, the details of which remain secret. Work thus continued with the design started at Tramiel Technology. With the basic design complete, the team started looking at solutions for the operating system. Soon after the buyout Microsoft approached Tramiel with the suggestion that they port Windows to the platform, but the delivery date was out about two years, far too long for their needs. Another possibility was Digital Research, who were working on a new GUI-based system then known as Crystal, soon to become GEM. A final possibility was to write a new system in-house, but this was eventually rejected due to risk. Prices current as of last update, 04/10/19 5:44pm.